On Sunday, August 4, 2013, Rev. Tony Ponticello addressed the assembled congregation at the Community Miracles Center in San Francisco, California. What follows is a lightly edited transcription of that talk. I'm going to pass this around so you really can look at it. 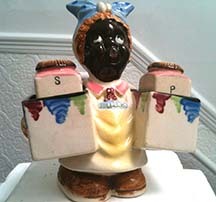 This is a Black Americana salt and pepper shaker. I think I paid a whole dollar for this. I remember seeing it and saying, "I gotta have that." This is a part of America that you just can't find any more. Now over the years I've had this on my kitchen table, and people have come in and said, "Tony, will you please get rid of that?" (laughter) But I have said, "Oh no. This is – no, no – this is a great thing." When I thought about doing my talk on race, and then I saw this salt and pepper shaker, I knew that I had to bring it in. I'm going to pass it around. When you get it in your hands, just to look at it and see what thoughts come up for you about this image. Think about the period of history that this represent for us, and for African Americans all over our fair country. A few weeks ago George Zimmerman was acquitted, found not guilty of any crime, for the shooting of Trayvon Martin. I'm sure all of you know the details about that. I don't have to go over any of the details about that particular event. A week after the acquittal of George Zimmerman, our president, President Obama, took to television and gave a very interesting talk on race. He talked about how he himself had been at the receiving end of racism and discrimination. He talked about how he himself, had been followed in stores because he was just a young black man. He talked about how he himself had heard the clicks of car door locks when he was younger, and as he walked near cars. It was very interesting for people to hear the President's talk. We got a lot of mixed reactions, but we did get a lot of positive one. One of the things President Obama said towards the end of his talk was this, "I think it's going to be important for all of us to do some soul searching. There has been talk about should we convene a conversation on race?" Then he went on to talk about how he doesn't think that is the government's job. He said, "On the other hand, in families and churches and workplaces, there's the possibility that people are a little bit more honest, and at least you ask yourself your own questions about, am I wringing as much bias out of myself as I can? Am I judging people as much as I can, based on not the color of their skin, but the content of their character?" When President Obama calls on churches to have conversations about race, or churches and ministers to have conversations about anything, it rings a bell in me. I hear it. I talked about this at our conference that we had in Chicago last April. I talked about when the President had called upon churches and ministers to start conversations about guns and gun violence. I spoke of how I took that in very personally, because I'm Reverend Tony Ponticello. So, when the President calls on us to have discussions about racism, I take it in. I think, "Why not?" Why not have a discussion about race and racism? I'm always looking for topics to give sermons on. The President has just called a topic out. So let's embrace this and see where it goes. I started posting, right after that, on various A Course in Miracles discussion groups that I belong to – a number of them on Facebook – "Let's, as A Course in Miracles students, have this discussion about race." It was interesting, because I got a lot of resistance to that. A lot of ACIM students do not want to have a discussion about race. They said things like, "You're just feeding into the fear and the separation of the world." They also said things like, "Don't do that, once you open that Pandora's Box, nobody wins. Nobody will benefit from having that discussion, because it's all about separation." I thought that was an unusual thing to say. Eventually, after I persisted, I did get some interesting discussion, especially after some African Americans joined the discussion. They were, of course, a little more open to having a discussion about race from an A Course in Miracles perspective. I remembered something that Marianne Williamson once said about these types of worldly discussions, because a lot of A Course in Miracles people think we shouldn't have these worldly discussions. Marianne Williamson said something to the effect of, "No, we're the very people who should be having these conversations." We spiritual students, with our spiritual perspective, need to enter these conversations. If we don't bring a spiritual perspective into these conversations, who's going to? We need to heal these situations. We are the very ones that have to be having these conversations. I resonate with that. Also, if nothing else, it's just an "outrageous request," as the Course says, from the President of the United States. Why would we refuse this outrageous request? A brother has asked for something. If it seems a little off to us, or odd, so what? Let's do it anyway. I don't have an authority problem. He is the President of the United States. I think it's much more powerful to actually relate to him like the President of the United States, a person of considerable authority. If he's called for a discussion in churches then, by God, I'm going to give him one. The quotation that hit me when I thought about A Course in Miracles and a discussion on race was this one, and it's the one that I've been putting out there on the ACIM discussion groups. It's the one that Rev. Alicia read a few minutes ago. It says, "No one is seen complete. The body is emphasized, with special emphasis on certain parts, and used as the standard for comparison for either acceptance or rejection of suitability for acting out a special form of fear." (OrEd.Tx.18.3) I've been reading that quotation for decades. I always thought it was an amusing quotation, but I never really thought about it in terms of race. When A Course In Miracles spoke of, "... special emphasis on certain parts, and used as the standard for comparison for either acceptance or rejection" (OrEd.Tx.18.3) the first thought I used to have was about the stereotyped, heterosexual man, who looks at women and looks at their figures, and he looks for their breasts, and looks for breast size – heterosexual men are supposed to prefer large breasted women. Classically, straight men are supposed to really like big breasted, hour glass proportioned, women. There is a lot of agreement about that. Straight men are really supposed to like that. Well, that's a standard of rejection or acceptance – mostly acceptance. The Course is asking us to challenge that. However, I've now had a shift in perception. I realized that the biggest part of the body, the biggest organ of the body, is actually skin. There is no bigger organ in the body than skin. Skin is the biggest part of the body. Acceptance or rejection on the basis of the look of that skin, the color of that skin, goes right to the heart of the matter in the discussion about race. So we think about darker skin people, or people whose color of skin doesn't appear to be whatever is this color of skin that caucasian people have, flesh colored, doesn't .... wait ... that term. Why is caucasian skin called flesh colored? Why isn't darker skin called flesh colored? You see when something is referred to as "flesh tone", it's always caucasian tone. I guess African Americans don't have flesh? I didn't know. That's very interesting. Acceptance or rejection – remember that we're not just talking about rejection. In some instances we're talking about acceptance. I know a number of, and I'm sure many people here in San Francisco do know a number of – this is especially true in the gay community – gay men who really like Asian men. These gay men like the color of that skin. This is a big thing in the gay community. There are many gay men who are strictly looking for Asians. It's not just the color of the skin. It's also the smoothness of skin. The fact is that Asians generally have less body hair than the other races. That is a particular body part, skin, being used for acceptance. That's what these gay men thinks turns them on. That's what they like. That's what they believe. So this idea of race, acceptance and rejection, it's very pervasive. It's all over. It's in every aspect of the whole world. Should we be discussing this, we as A Course in Miracles students? If we discuss race aren't we, or am I, not just breading more separation, reinforcing separation? Why do I want to do this? A Course in Miracles says, "The dreamer who doubts the reality of his dream while he is still dreaming is not really healing the level-split." (OrEd.Tx.4.10) If I pretend that these issues aren't out there, that they're not real, while I'm still here in this world, that's not a healing modality. It's not healing to pretend that this isn't going on. It is going on. We all participate in it in some way, shape, or form. It's not healing to ignore it. That will not heal the level split. In another place A Course in Miracles says this, "Conflict must be resolved. It cannot be evaded, set aside, denied, disguised, seen somewhere else, called by another name, nor hidden by deceit of any kind if it would be escaped. It must be seen exactly as it is, where it is thought to be, in the reality which has been given it, and with the purpose that the mind accorded it." (OrEd.WkBk.333.1) We can't get out of this racial tension, racial conflict, by disguising it or denying it. "It's not really real. It's not truly a problem. I'm not racist – not a problem. I don't see it." That's not going to do anything. We have to see the problem exactly as it is, with all the reality that our mind has accorded it, if we're ever going to get past any of this. This is a big problem. I see it's a big problem out there in our culture. It's a big problem out there in the world. We have an African American president. He's faced an amazing amount of rejection. His policies get rejected out of hand. There's a whole contingent of legislatures who are just against anything that he says. Have we ever known a president before, in the history of the United States, that was demanded to show his birth certificate? I mean, what the hell was that about? So the "birthers" demanded to see his certificate. Then, after President Obama shows his birth certificate, they deny that it's a real, authentic birth certificate. There's some major conspiracy that somehow President Obama is not a legitimate president? He's some sort of foreign alien? Racism exists all over. Some people think, "We've got an African American president now. I guess racism is over." Well, I don't think so. I think it's definitely still going on. The President asked us to ask ourselves, "Am I wringing as much bias out of myself as I can?" Am I wringing as much bias out of myself as I can? That's a great question. We should all be asking that question. I asked myself that. I'm not racist. I certainly don't consider myself racist, and then I thought, "Hey, I date a darker skinned woman. I've dated this darker skinned woman for twenty-two years, so obviously that must prove that I'm not racist." Now this darker skinned woman that I date, Rev. Dusa Althea, would not define herself as African American, because she's not. If you asked her what race she is, she probably would say she's mixed racial, which is what I've heard her say a lot. But, there is that fact that her skin is darker so, maybe I could feel that definitely proves that I am not racist. However, I do have body part bias. I really have to admit that. I'm a non-monogamous, bisexual man. I date men and women, concurrently. Not serially like some bisexual people. I date both genders concurrently. What I've noticed is that all the women that I date are smaller than me. They're always shorter than me. They're always a little more petite than I am. I guess I'm just not attracted to women who might even be as tall as I am. I'm not that tall, so there are women I encounter who are as tall as I am, maybe a little taller. Some are bigger. However, I never am sexually attracted to that body type. I'm just not attracted to them. Why? What kind of bias is that in my mind? This is particularly interesting for me, being a bisexual, non-monogamous man, because I will date men who are taller than me. I'll date men who are bigger than me. The bias doesn't exist there with men for some reason, that particular body size bias. I have different acceptance ideas, biases, about body height and size with women and men. So, am I wringing as much bias out of myself as I can, body part bias? Well, I don't know. I guess there's still some there. I definitely still have some there. I am going to think about this. There's many other challenging things in A Course in Miracles. We tend to look at ACIM, and then we like to sum up the discipline. We like to bring it to its lowest common denominator. It's all about love. We're all equal, and it's all about forgiveness. That's great. It is all about those things, but the Course has some very challenging ideas in it. People tend to gloss over some of the challenging things, and pretend they're not there. This idea, I think, is particularly challenging if you think about it. It says, "If you seek to separate out certain aspects of the totality and look to them to meet your imagined needs, you are attempting to use separation to save you." (OrEd.Tx.15.46) If we seek out particular bodies .... If I seek out just women who are shorter and more petite than I am to satisfy my imagined sexual needs, then I'm attempting to use separation to save me. Why am I not open to everyone? I think I am, but I can tell there's a body type selection bias going on. But I think it's even bigger than that. It's really bigger than that. If you have sexual needs, and most of us do, but you think they're only satisfied by one gender, aren't you separating out certain aspects of the totality, and looking to them to satisfy your imagined needs? Doesn't that mean that you have some body part bias? If you think only penises are going to satisfy your sexual need – that's a body part bias. Isn't it? If you think only vaginas are going to satisfy your sexual needs, isn't that also a body part bias? Isn't the A Course In Miracles asking us to challenge this? I'm not saying this to promote bisexuality. I just saying this to show that we all have these biases going on. Our whole culture has these things going on all the time. We don't look at society as a totality. We don't look at it as all equal. We think certain aspects of it are going to satisfy us, or somehow give us what we're looking for. And I think that's what I, as an A Course in Miracles student, want to challenge. I want to challenge all this body part bias, because even though I might not be what I define as racist, if I have a body part bias, I am contributing to that same energy. That is what racism is based on, so it isn't really separate from me. It isn't really different from me. If I can confront my own body part bias, maybe I can help look at and do some healthy shifting of the energy on race. Let's get back to race a little bit. As I said, we have an African American president, right? Well, actually we don't. We don't have an African American president. We have a mixed racial president. He's not really African American. You can call him African American. We can call him "Black," maybe. Let's face it, he's mixed racial, and let's face something else, he's not very dark. He's pretty light skinned. Ask your self this question, "Would we have had been able to elect an African American president if he was a real dark skinned Black man? Probably not. I don't think so. Not yet. We are not quite ready for that. We probably needed somebody that was mixed racial to make the first movement in that particular direction. When I chose the illustration for the blurb that went out on the Sunday Service announcement email, and for the cover here (Rev. Tony holds up the Sunday Program. See illustration. ), this illustration elicited some negative reactions from some people, and I thought, "Why?" "What is that?" This is a dark skinned, African American man. Looks pretty happy, and he's dressed in a tuxedo. He's affluently groomed. He looks very normal. What could possibly be racist about this particular illustration? Yet some people reacted to it that way. Maybe it conjures up images of an African American porter on a train, or just a servant dressed up in a classic servant's tuxedo. Is that what we think? That's interesting, because if it was a white, caucasian, smiling man, dressed up in a tuxedo you might think he was a groom getting married. But when you look at this picture, you don't automatically think that it's an African American groom, in a tuxedo, getting married. No, there's some sort of racial profiling going on here. We look at this picture and we don't think "groom." I think about the salt and pepper shakers that I passed around. That's an image of Black, African American culture and some people think that's a racist thing. However, a number of years ago Rev. Dusa Althea and I were over in the museum in Oakland, which we visit every once in a while. We went into a particular room and they had an exhibit on what was called "Black Americana Art" and it was filled with stuff just like that, just like that salt and pepper shaker. That's considered high art now. It's a particular type of art, a particular period in American culture. It is thought of as very important that African Americans actually look at these items and see them part of their heritage, and in many ways, take it in and embrace it positively. Again, not to pretend that it didn't exist. Yes, those were racial stereotypes, but those racial stereotypes are part of our history, and looking at them and having a reaction is A Course In Miracles consistent, because it is looking at the conflict and seeing it with all the thoughts and symbolisms that it has. I think it's important that we do look at those things, think about them, and think about what our reactions to them are. Actually, Black people, African American people, aren't trying to pretend that they don't exist. They're not trying to push those items out of their collective past. They want to see them, embrace them, and remember their heritage. It's Black Americana Art. I went to see a movie this week named Fruitvale Station. A couple of you may have seen Fruitvale Station. It's a movie based on the incident that happened in 2009, to a young African American man – hardly a man just 22 years old, almost a boy – but a young man. This young African American man, named Oscar Grant, was killed on New Year's Eve night, actually early in the morning New Year's Day, coming back from San Francisco from watching our annual fireworks display. There was an altercation that happened on a BART train (Bay Area Rapid Transit – a multi-county San Francisco Bay Area subway system). He was killed by a police agent. The yound man killed was named was Oscar Grant, and it was caught on video by many, people. It was a full BART train; there were people all around. People were videoing it on their cell phones. The movie starts with one of actual phone videos of the whole thing. Then the movie backs-up and follows the Oscar Grant for the last 24 hours of his life, the last day of his life. It shows that he was just an average guy. He wasn't perfect; he had some issues. By the end of the film, as you have gone through his day, you've gotten to know him. You see the good and the bad. You've gotten to love him. Then this whole tragedy happens. A lot of it is because – you can tell it is only because – he was a young black man and a white policeman was profiling him. The defense from the policeman was that the policeman didn't realize he actually was grabbing his gun, with a bullet. He thought he was grabbing his stun gun, his taser. He thought he was shooting his taser. He did wind up spending almost a year in jail, but now he's out of jail. That's all the time he spent. The movie got me thinking. A small thing I can do for my healing of my racial biases, is to keep looking at movies like this. Maybe they don't seem to relate to my life experience directly, but I should try to understand the racial issues and the racial problems that go on in this culture and not just dismiss them like they don't exist. It's actually a very good movie. I've seen movies that have thousands and thousands of bullets flying all over the place. However this movie is about just one bullet. There's only one gun shot fired in this movie. One small bullet, and you see what an effect one small bullet can have. It was done very well. The acting was really, really terrific. Treyvon Martin was an unarmed seventeen year old kid. He was just a kid. He was coming back from the convenience store with some iced tea and candy, some Skittles. George Zimmerman, who was an armed neighborhood watch person, profiled Treyvon Martin, stalked him, reported this to 9-1-1, was told not to follow him, followed him anyway. George Zimmerman got out of his car, and confronted Treyvon Martin. Then a fight ensued and Trayvon Martin was shot and killed by George Zimmerman. According to the law, no crime was committed. This is something we need to look at. We need to look at how much race played into this tragedy. We also need to look at how much race played into the shooting of Oscar Grant at the Fruitvale, BART station. This article appeared in the August 2013 (Vol. 27 No. 6) issue of Miracles Monthly. Miracles Monthly is published by Community Miracles Center in San Francisco, CA. CMC is supported solely by people just like you who: become CMC Supporting Members, Give Donations and Purchase Books and Products through us.